Last season, the Billings Wildcats entered District play with a 22-3 record and their sights set on a deep run in the Class 2 state playoffs. However, the Wildcats’ season was ended prematurely by upstart New Covenant Academy, which defeated Billings 100-99 in a double overtime thriller in the first round of District play. The Wildcats then had to sit back and watch Crane, a Southwest Central League rival, capture the District title en route to winning the 2011 Class 2 state championship. Billings plays at a frenetic pace, and the Wildcats’ swarming and relentless style of play got them off to a fast start in the championship game. Keyed by a barrage of three-pointers to start the game, Billings scored the first 11 points to take a commanding early lead, and led 23-12 at the end of the first quarter. The Wildcats connected on 5-of-7 three-pointers in the first period. Salisbury, which trailed by 18 at halftime, did play catch-up in the second half, as the Panthers’ full-court press caused Billings some problems and enabled Salisbury to claw back into the game. However, Billings was nearly flawless at the free throw line, connecting on 28-of-37 free throws in the second half to keep Salisbury at bay. Many of the free throws came in the final minutes and thwarted the Panthers’ comeback bid. 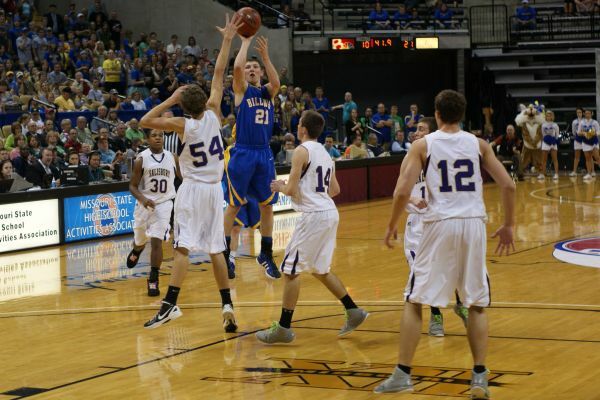 For the game, the Wildcats hit 36-of-47 free throws, both records for a boys state championship game. Junior Chad Yeokum led Billings with 25 points, while the Wildcats’ balanced attack placed three other players in double figures. Sophomore Dawson Meyer came off the bench to score 21 points, while Harter and junior Austin Essick scored 14 points apiece. “We are a classic ‘run and gun’ team,” said Jenisch. “We never let the opponent have a chance to rest.” With a roster full of players capable of leading the team in scoring, Billings’ offensive philosophy often involved determining early on in a game who was feeling it and then making sure that player got plenty of touches. “We are always finding who is hot and getting the ball to them,” said Harter. Billings began the season with the state’s top ranking in Class 2—and a heavy load of expectations with every player back from the 2010-11 season. The Wildcats started the season strong and entered the semifinals of the Southwest Holiday Tournament on Dec. 28 with an 8-0 record before losing 81-60 to the tourney hosts. The loss served as a reminder that, even though talented, the Wildcats could be beaten on any given night. “We knew that we couldn’t hiccup late in the season like we did against (Southwest) or we would not make it (to State),” said Jenisch. “They were a good team and we just didn’t compete the way we should have.” The loss to Southwest “showed us that we have to come to play every night,” said Chastain. Following the loss to Southwest, Billings regrouped and reeled off seven-straight wins, including a convincing 77-59 victory over Harrisonville in the first round of the Nixa Invitational Tournament on Jan. 26. 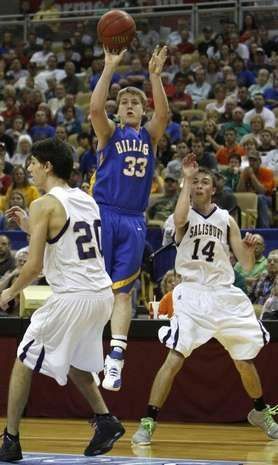 That win advanced Billings into a second-round match-up with Nixa, which was ranked #1 in Class 5. 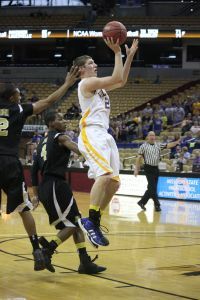 The Wildcats hung close with the powerhouse Eagles for a quarter, but eventually Nixa pulled away for an 87-57 victory. Billings then lost the next night 74-60 to Mt. Vernon. Nixa would go on to finish as the Class 5 state runner-up, while Mt. 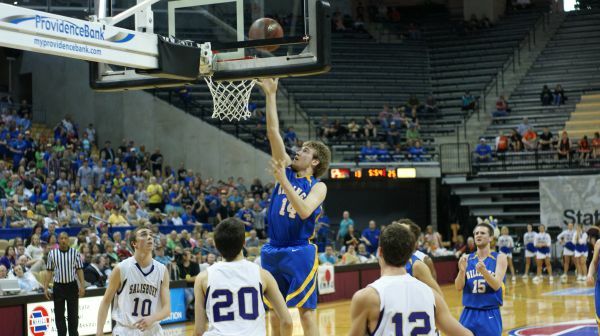 Vernon advanced to the Class 3 Final Four. Competing in the Nixa tournament against the larger schools, coupled with the large crowds in attendance, helped prepare Billings for its state title run. Billings rolled unbeaten through the rugged SWCL to capture a conference title. The SWCL is one of the top small school conferences in the state, and has produced four Final Four participants in the past five years, including the past two Class 2 state champions. Billings got a severe test in the next-to-last game of the regular season against Marion C. Early. The visiting Panthers, who entered the game ranked #7 in Class 3, led Billings by 13 with just 4:34 to play before Billings staged a thrilling comeback. The Wildcats turned up the defensive pressure, which keyed a 15-3 run to cut the deficit to one point at 56-55 with just 32 seconds left in the game. Following a Panther free throw, junior Austin Essick nailed a three-pointer to give Billings a 58-57 lead with 16 seconds left. The Panthers hit a pair of free throws, though, with 0.8 seconds on the clock to push Morrisville back in front 59-58. What followed will surely be recounted for years to come in Billings basketball lore. Essick took the ball out of bounds following the second made free throw and threw a perfect baseball pass to an open Jenisch, who laid in a shot at the buzzer from the right block to give Billings an improbable 60-59 win. The victory sent Billings into District play with a ton of confidence, and the Wildcats immediately dispatched Marionville 69-41 in the District opener. Waiting in the semifinals was Spokane, an SWCL foe and a team that was playing with a lot of heartache, emotion, and inspiration following the untimely and tragic death of teammate Forrest Varney on Feb. 15 after he collapsed and later died of a pre-existing heart condition. “We knew they were going to be on their game and to get a win we would have to play our best,” said Chastain. The game was nip-and-tuck throughout, as the Owls led 16-12 after one, and 37-34 at halftime. The game remained close throughout the second half, and was tied in the final seconds. Billings thought it had pulled off another miracle length-of-the-court pass and basket to win the game in regulation, but the basket was not allowed. The Wildcats outscored Spokane 15-11 in overtime to advance with a hard fought 81-77 victory. Billings defeated Greenwood 78-63 to win the District title, and then dispatched Wheaton 89-78 in the Sectional round, as Chastain led the Wildcat attack with 23 points, while Harter poured in 22. Yeokum and Essick scored 17 and 15, respectively, as Billings once again had multiple players in double figures. In the state quarterfinals against Norwood, Billings let an 11-point fourth quarter lead slip away, as the Pirates rallied to take a 56-55 lead with 2:21 to play. A pair of Essick and Chastain lay-ups gave Billings a three-point lead, and the Wildcats would escape with a 61-58 victory. Harter led Billings with 20 points, while Chastain scored 17. Billings entered its state semifinal game against Hayti with a 27-3 record and 12-game winning streak. The Indians countered with a 27-4 mark and eight-game streak. The first half was another back-and-forth affair, as both teams put together mini-runs. There were seven ties and eight lead changes in the first half, as Billings went to the locker room with a 29-28 lead. Hayti came out hot in the third quarter, and quickly took a five-point lead, but Billings rallied and the score was tied 41-41 with 3:06 left in the period. Billings closed the quarter with a 14-2 run to lead 55-43 heading to the fourth quarter. 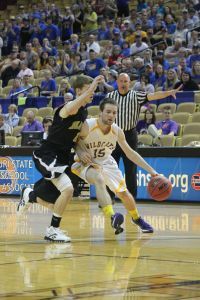 Hayti would get no closer than 10 points the rest of the way, and Billings stretched the lead to as many as 26 points before settling for a 79-60 victory, which sent the Wildcats into the state championship game. Both Chastain and Essick were named to the Class 2 All-State team, and both surpassed the 1,000-point career scoring plateau this season as juniors. Jenisch and Harter provided scoring and a steadying influence as the two seniors in the starting lineup. Yeokum was the other regular starter, while Meyer was the team’s sixth man who regularly saw starter’s minutes. 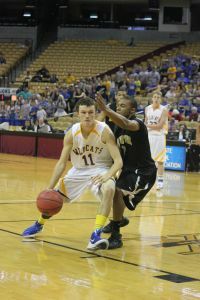 Junior Lane Truman was another key contributor off the bench for the Wildcats. Senior Nathan Blades, junior Seth Hagerman, and sophomore Sawyer Hawkins pushed the others in practice each day and provided depth. “This was a special year that nobody will ever forget,” said Meyer. “Coach Tilley did a marvelous job coaching us. We had tremendous leadership from our seniors and they will be missed.” With three starters back next year, including a pair of All-Staters in Essick and Chastain, as well as the team’s top two reserves, expectations will once again be sky-high again for the 2012-13 season. Originally published in the March-April 2012 issue of Ozark Preps Illustrated.